As Labor Day weekend approaches, my father’s admonition to “work smarter, not harder” comes back to me. I was talking with a friend last week and he mentioned that they had begun pulling buckthorn on their newly acquired property in Columbia County. There is no other way to say it; pulling buckthorn is hard work. In the following days, I thought about the many buckthorn projects that dot my past twenty years of conservation work in Wisconsin. Along with the blisters and sore muscles came hard earned experience that changed the way I look at habitat restoration in general and buckthorn clearing in particular. First is to avoid the “activity trap.” We see a problem and want to tackle it head on. More to the point, we see the most obvious problem and take it on with the first or only tool we know. Years ago I learned that being successful means doing right things right. That means before doing anything, it is important to know that you are doing the right thing. Doing the right thing can only happen once you have looked at the situation strategically. Why do you own a substantial piece of property? Usually there are several reasons, such as: having access to productive hunting land, getting away from urban life, giving your children an opportunity to learn about nature, or secure long-term income from forest crops. If one of those reasons is that you want to preserve the natural heritage of your property, then protecting native plants and getting rid of invasive weeds and brush are important goals. It might not jump out at you right away, but the best way to achieve those goals is to preserve and protect the good stuff first. None of us has enough money to do everything at right now. Once you ensure the best pieces of your land stay in good shape, you can take on the lower quality sections. Using this strategy makes sure the whole property stays at least as good next year as it was last year and hopefully a little better. With a prioritized list of tasks, you will know you are doing the right things … and in the right order. Then you are ready to decide whether you are doing things the right way. If there ever was an case of, “when all you have is a hammer, everything looks like a nail,” pulling buckthorn is it. There are a range of methods for removing buckthorn, pulling is the most tedious and labor intensive. Buckthorn produces both male and female trees. Once they are mature, male trees produce pollen while the female trees produce fruit with seeds. So, when it is time to tackle that big stand of buckthorn, the first targets should be the mature female trees. A wise man told me that, “when you dug yourself a hole up to your neck, for heaven’s sake put down the shovel.” Buckthorn seed is viable for more than seven years; so the sooner you eliminate the seed producer trees, the sooner you will start running out the clock on that seed bank. Clearly, mature buckthorn trees are too big to pull with anything but a bulldozer, so we are talking chainsaw work. Cut trees as close to the ground. This will prevent tripping hazards and damage to equipment once the grasses and wildflowers grow up. Treat stumps with Triclopry at the cut stump rate on the label. Add dye to the solution so you can see where you spray. 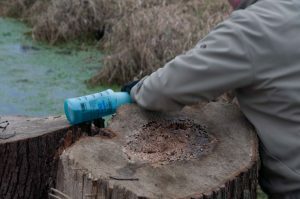 Use a small hand sprayer and only apply the herbicide to the outer ring of the stump where the sapwood is found. This will save you a lot of chemical and limit collateral damage. If you are cutting this fall, haul and stack the trees in the tightest brush piles you can manage. 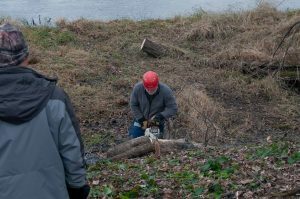 Run your chainsaw through the brush pile to reduce the size because this will make the piles burn much easier. Burn the brush piles once there is snow on the ground. The wood will have had time to dry out and snow will prevent embers from starting a wildfire. After the first snow is also a good time to spread seed for next spring. Once you open up the soil by removing the buckthorn, you will be amazed at how quickly things pop there next year. Chief among the spouts will be baby buckthorn seeds. If you do not get native seeds started, you will end up with a stand of new buckthorn even more dense than what was there before. Because there will be buckthorn seedlings sprouting up next year, consider doing a controlled burn of that section of property in the following fall after the summer grasses and wildflowers go dormant. Fire will kill the new buckthorn seedlings which will still be green but will not harm the native plants that will already be sleeping for the winter. To my friends getting started on their new property; best of luck and enjoy the journey. Hope these insights will help you see more success sooner. Stepping back and getting to know your land and playing out your plans into the future will allow you to make better decisions and achieve your goals.